Telehealth initiatives hold exciting potential to address healthcare access issues in Delaware and beyond, whether from shortfalls in critical healthcare specialties, or in under-served geographic locations. Telehealth also provides innovative ways to meet the demands of an aging population, reduce inappropriate use of emergency departments, prevent hospital readmissions, bring care to the most appropriate setting and more. This certificate program provides the foundations of telehealth for participants interested in utilizing telehealth for the delivery of healthcare, including technology evaluation, business and operational considerations, regulations, ethics, privacy and more. This is a self-paced online course with some scheduled requirements and assignments. The Advanced Telehealth Coordinator course begins by providing participants with the foundation needed to understand the benefits and uses of telehealth as well as the role of the telehealth coordinator. As the curriculum advances, participants dive deeper into the knowledge and skills necessary to support the use of telehealth applications within a health care organization. The course culminates in the exploration of telehealth project and program management. This 15-week course provides a comprehensive program of instruction, exploration, discussion and practice. While examining the practical, technical and business aspects of telehealth, participants will also explore the creative aspects of utilizing technology to deliver health care in order to prepare for the continued growth of telehealth. There are no academic prerequisites to enroll in this program. Delaware Department of Corrections turns to telemedicine because of doctor security fears following riot—"Since launching about one year ago, about 100 inmates have used video telemedicine," May 16, 2018. 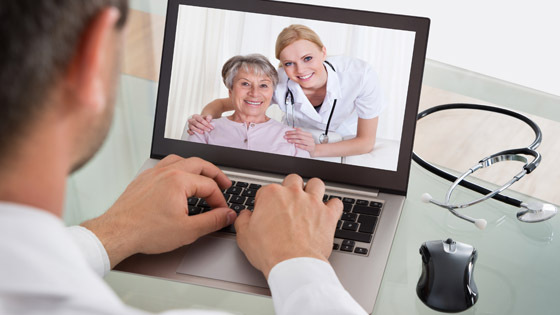 State Medicaid Programs Are Seeing the Value of Telehealth at Home—Delaware is among the states recently amending its telehealth policies to "specifically make the patient’s home an originating site for Medicaid-accepted telehealth and telemedicine programs," May 15, 2018. Increasing healthcare access through telemedicine technology—Healthcare providers in Delaware are adopting telehealth to increase patient access to healthcare, September 1, 2017. The University of Delaware's Advanced Telehealth Coordinator Online Certificate Program is an approved Lower Level Health Science elective (3 credits) for Wilmington University's Bachelor of Science degree in Health Sciences. For details, contact Wilmington University at coel@wilmu.edu. This activity has been planned and implemented in accordance with the accreditation requirements and policies of the Accreditation Council for Continuing Medical Education (ACCME) through the joint providership of the Medical Society of Delaware and the University of Delaware. The Medical Society of Delaware is accredited by the ACCME to provide continuing medical education for physicians. The Medical Society of Delaware designates this live activity for a maximum of 45 AMA PRA Category 1 Credit™. Physicians should claim only the credit commensurate with the extent of their participation in the activity. Joint providership of CME by MSD in no way implies endorsement of any product or service. Carolyn Morris is the Director of Telehealth Planning and Development with Delaware Health and Social Services (DHSS) and co-chair of the Delaware Telehealth Coalition. Prior to her current role with DHSS, Ms. Morris served as a planner with the Division of Services for Aging and Adults with Physical Disabilities, spending a large portion of her time developing and coordinating the activities of the Delaware Telehealth Coalition and managing DHSS telehealth projects. She holds a master's degree in health services administration and a bachelor of science in database administration, both from Strayer University, and earned her certificate as a Telehealth Program Manager from the University of Alaska Southeast (UAS) and the Alaska Federal Health Care Access Network (APHCAN). She also represents Delaware on the Mid-Atlantic Telehealth Resource Center's Advisory Board.